Performing on December 6 will be violinist Ji Won Song, accompanied by Richard Fu, piano. Celebrated Korean violinist Ji Won Song delights audiences worldwide with energetic performances that express her refined perspectives on melody, color and harmony as well as her deep passion for her instrument. 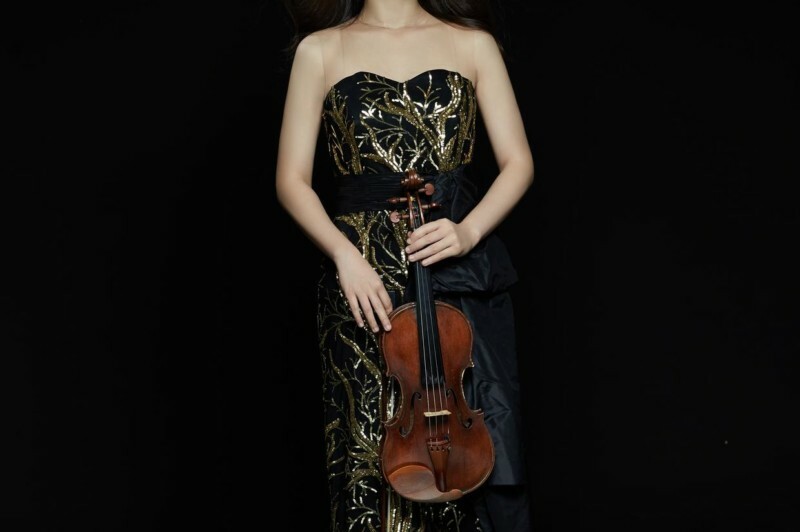 She received first prize and the audience prize at the Leopold Mozart Competition in Augsburg, first prize and the classical music prize at the China International Violin Competition in Qingdao, first prize and the best Chinese work prize at The Alice & Eleonore Schoenfeld International String Competition and first prize with the audience prize in The Schadt Competition. She was also a prize winner at Concours International de Violon Tibor Varga, the Carl Nielsen International Violin Competition and the Yehudi Menuhin International Competition. Ms. Song has also won many awards for her work, including the esteemed Milka/Curtis Artist Prize, awarded by the Curtis Institute of Music in conjunction with the Markow Toteyy Foundation. Ms. Song has performed at concert halls and recital spaces around the world including the Kennedy Center, Kimmel Center, Shanghai Symphony Hall, Seoul Arts Center, Kongresshalle and Jordan Hall. She has been a featured soloist with the Philadelphia Orchestra, Seoul Philharmonic Orchestra, Shanghai Symphony Orchestra, Montreal Symphony Orchestra and the Munich Radio Orchestra, with conductors including Rossen Milanov, Augustin Dumay and Nanse Gum. Ms. Song is currently pursuing the Artist Diploma program at the Julliard School, where she studies with distinguished violinists Donald Weilerstein and Ida Kavafian. Shanghai-born Richard Fu is currently studying collaborative piano at Juilliard, having previously attended Oxford University, the Royal College of Music (RCM), and Dartmouth College. Though he had wanted to become a lawyer growing up and began as a political science major at Dartmouth, Richard fell in love with classical music while studying abroad in Vienna and changed focus to music midway. At Dartmouth, Richard won the Mark L. Lebowitz 1977 Memorial Prize for outstanding undergraduate music student, Macdonald-Smith Prize for high achievement in musical performances, and the Gerald A. Tracy Memorial Scholarship Piano Competition. Other prizes include the Los Angeles International Liszt Competition and RCM’s Kendall Taylor Beethoven Competition. Richard has performed concertos with the Oxford University Philharmonia, Dartmouth Symphony Orchestra, Dartmouth Chamber Orchestra, and the Basement Orchestra. An avid chamber musician, he has accompanied the masterclasses of Maxim Vengerov and Roderick Williams, and received coaching from Menahem Pressler and Roger Vignoles. Richard co-found Béla Ensemble, a clarinet-violin-piano ensemble focusing on contemporary music. He performed Stravinsky’s Septet as part of RCM’s collaboration with the Philharmonia Orchestra in the Stravinsky: Myths & Rituals Festival, as well as Steve Reich’s Double Sextet during the composer’s residency at the RCM. Recent performances include his debut at Carnegie Hall (Weill Recital Hall), and recitals in the Sheldonian Theatre, Holywell Music Room, Victoria & Albert Museum, St. John’s Smith Square, Regents Hall, Roman Music Festival, Oxford Lieder Festival, and on tour in cities across China. Richard’s most important teachers and mentors include Victor Rosenbaum, Andrew Ball, Sally Pinkas, Steve Swayne, and Hong Teng. During the summers, Richard enjoys attending music festivals through which he has learned from pianists such as Dimitri Alexeev, Paul Badura-Skoda, Boris Berman, Christopher Elton, Robert McDonald, and Peter Serkin. This past summer, Richard was a fellow at Music Academy of the West, where he met his current teacher Jonathan Feldman and also played the celeste in a concert conducted by Alan Gilbert featuring Renée Fleming.